As I have been laboring over writing this last several weeks, I have started and half-completed many different posts. The 3rd part of the sin series is all but complete and yet it lacks something – I am not sure what it is so I have left it in a folder as I wait upon the Lord to give me wisdom and insight as to what I should do with it. Maybe He wants me to start over. Maybe He wants me to meditate on the verses I am using a little longer. Maybe I am not a good enough writer to say what needs to be said. I can’t tell you right now or it wouldn’t be sitting in a folder. That being said, lately I have been inundated in my email, my Facebook, and different churches I have attended with tons of, ummm, stuff – some of it downright foolish stuff. he who keeps his mouth shut can pass for smart. As I started thinking, my mind became flooded with thoughts such as holy ghost laughter, kicking people in the face with their biker boot to heal them, laps for Jesus, toking the ghost, snorting lines of scripture, prophecy only having to be 60% correct, demons in believers, people barking like dogs and being led on a leash in church, allergies are demonic, Jesus being a derivative of Zeus, the doubting of Paul, deconstructionism, Christianity is pagan, Messianics are Judaizers, we are little gods, Ishtar eggs, health and wealth . . . The list is so long that if I were to put them all down, there would probably be over 3 pages of the above paragraph. You know what is wrong with the above paragraph? All of the stuff is missing the 2 most important commandments. The focus is not on these commandments. It is on stuff . . . pat yourself on the back stuff! Prideful, arrogant, and foolish stuff! with all your heart and with all your soul and with all your strength.’ 38 This is the greatest and most important mitzvah. So how do you learn how to do this? How do you gain the wisdom necessary to do this? To apply this? Let’s turn to Mishlei, or as you are probably more familiar with, Proverbs. and the young person with knowledge and discretion. The word “proverb” is ‏מָשָׁל‎ māshāl. Phonetically: maw-shawl. Thoralf Gilbrant, ed., “5091,” in The Complete Biblical Library Hebrew-English Dictionary – Kaph-Mem, (Springfield, IL: World Library Press, Inc., 1998), WORDsearch CROSS e-book, Under: “5091”. It is wisdom in contradistinction to foolishness. The psalms are made up of proverbs. You could call the psalms “songs of wisdom” and you would not be incorrect. So how do the Proverbs start? What is the first saying of wisdom? Did you notice that the first saying of wisdom from the very wise King Shlomo (Solomon) is a battle? It is the battle between those that seek wisdom and those that despise wisdom. If you will remember from verse 2, one of reasons for the Proverbs: are for learning about wisdom and insight – something that verse 7 tells us that fools despise (regard with contempt). Can it not then be concluded that since wisdom and knowledge comes from Adonai, that if fools despise wisdom, that they also despise Adonai? I will let you think about that one for a second . 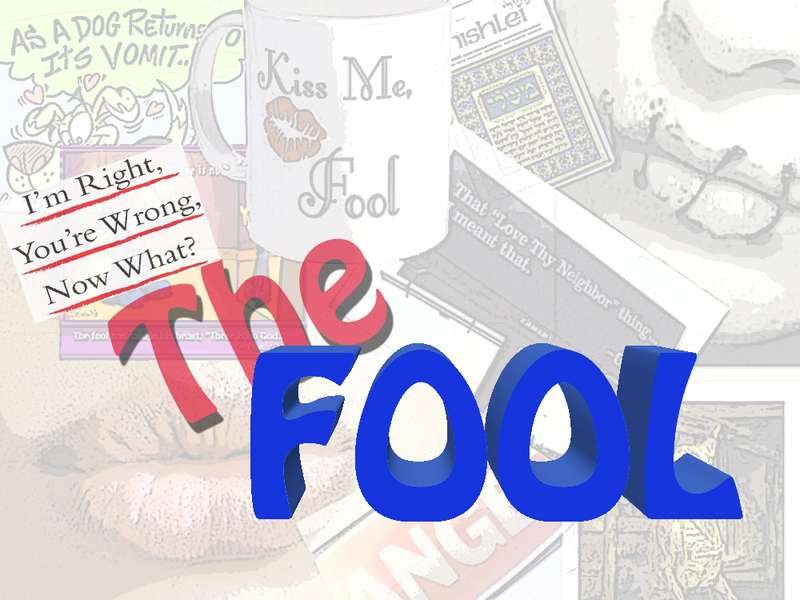 . .
A good place to start to see if what I have said is true or has merit might be to see what is the biblical meaning of FOOL is. To be a fool has the meaning of to be perverse . . .
Thoralf Gilbrant, ed., “188,” in The Complete Biblical Library Hebrew-English Dictionary – Aleph-Beth, (Springfield, IL: World Library Press, Inc., 1998), WORDsearch CROSS e-book, Under: “188”. Proverbs 7:1-27 (CJB) 1 My son, keep my words, store up my commands with you. 2 Obey my commands, and live; guard my teaching like the pupil of your eye. 3 Bind them on your fingers; write them on the tablet of your heart. 4 Say to wisdom, “You are my sister”; call understanding your kinswoman; 5 so that they can keep you from unknown women, from loose women with their seductive talk. a young fellow devoid of all sense. and continues on toward her house. and finally night, dark and black. lurking at every street corner. and I fulfilled my vows today. to look for you; now I’ve found you. made of colored Egyptian linen. enticing him with her seductive words. till an arrow pierces its liver. don’t stray onto her paths. numerous those she has killed. it leads down to the halls of death. will have no share in the Kingdom of God? none of them will share in the Kingdom of God. and disown our only Master and Lord, Yeshua the Messiah. One of the perversions I am particularly passionate about is the “we are not under the law but under grace so God will forgive me” excuse for doing such things. That is a perversion! Look at 1st Corinthians again and tell me that it is not a perversion. To put it more bluntly – it is foolish! and keep holding him up to public contempt. So, do you re-crucify Messiah? Do you hold him up to public contempt? Does your lifestyle pervert him? Could we not also say as a warning in the future to fools? people who have just begun to escape from those whose way of life is wrong. I know many fools that call themselves believers. Iron doesn’t sharpen iron with them because in their estimation, their blade is always sharp. They don’t pay attention to advice because they have no desire for counsel – no respect for correction – their truth is the only truth they will consider. They suppose their way is straight . . .
but a cautious person slighted conceals his feelings. for any fool can explode in anger. 0 – angry in 6.2 seconds. There is no self-control. patience, kindness, goodness, faithfulness, 23 humility, self control. In other words, there is nothing in the Torah that can be perverted through legalism to be in opposition to love, joy, peace, patience, kindness, goodness, faithfulness, humility and self-control . . . It could be safely said that a fool clothes himself in pride and that anger is his hat . . .
but among the upright there is the favor of God. but he who heeds warnings is prudent. As you can see, the FOOL can be a prideful, undisciplined, and angry person. He is right whether he is right or wrong. He despises wisdom. He despises correction. His way is straight so he needs no accountability – no advice. In fact he would despise correction and accountability. Indeed, I suspect the only advice a fool may heed, if he heeds any, is another fools. shows that he does not love Adonai with his whole heart . . .
. . . until he does, he will continue to be a fool. This entry was posted in Thoughts, Word Studies and tagged ‏אֱוִיל, ʾﬂwîl, fool, love Adonai your God, Love your neighbor as yourself, Mishlei, māshāl, proverbs, מָשָׁל. Bookmark the permalink. 2 Responses to Are you a FOOL? Wow. I have always loved your teachings on being foolish or a fool. Again I thank you for sharing this with everyone. Very important lesson and not one to be taken lightly. thanks for the encouragement! I agree!